I preface the following remarks with this: I’ve been shopping at Martin’s Country Market for better than 25 years, and will continue to do so. This treatise is written as an op-ed expose and, for the grocery shopping populace, a caveat emptor for all grocery and retail stores. Seriously? What kind of nonsense is that? If an item is on sale, advertised publicly or not, and you’re out of it, the customer should get a rain check. It’s that simple. So I sent a message about this experience to both Martin’s and the Family Owned Markets (FOM) retail organization via their respective web sites. The text was basically what you just read in the previous paragraph. In the meantime, I posted the same on my Facebook timeline. Meanwhile FOM got back to me, saying they would forward the message to Martin’s, but that they have no say in individual store policy. Fine. We received your post from Facebook. Our Customer Service Representative was following our company policy on that we only issue rain checks on advertised items. The item you looked at is a TPR (Temporary price reduction) most times these items are on for 4 weeks. The Bigelow tea is on till April 30th. I am sorry for any inconvenience this might have caused and if we do not have the kind you want by that date, I will make sure that we hold one for you and honor that price. Well, there’s something to be said for lodging a complaint. Yet, there’s some interesting dilemmas created by the Martin’s response. Whether she releases it or not, Ms. Guare’ response establishes a new precedent, changing store policy. In a single email, which I still retain, Martin’s did offer a rain check for the TPR, if only for me, which they should have done and should do for every customer. The second conundrum is their confusing differentiation between sale items, an in-store “temporary price reduction” and publicly circulated advertised sale. Simply and quite logically, a sale is a temporary price reduction, whether advertised publicly or in-store only. Therefore, for any sale or a temporary price reduction, for whatever duration, advertised publicly or not, if the store is out of the item a customer wants, then that customer should get a rain check for that item. It stands to reason. To do otherwise is simply a contradictory double standard and makes for bad store policy. Essentially what we have with here at Martin’s is simply bad store policy. 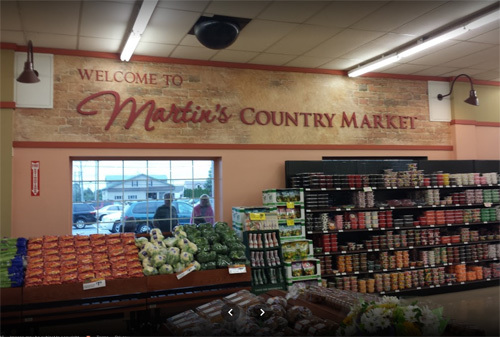 As I’ve often said, “There’s the right way, the wrong way, and then there’s the Martin’s Country Market way.” Sometimes, when it comes to company policy, the latter two are indistinguishable from each other. Not allowing rain checks for all sales, advertised or not, temporary price reduction sales or weekly sales, is hypocritical and a contradictory double standard. It’s also an insult to Martin’s Country Market customers. Additionally, the company was founded by Mennonite Christians. So how does their policy promote just fairness in life and work, a cornerstone of Mennonite practical theology? I’m not sure. But this is the same company store that offers customers free coffee, next to the bakery, and then asks for a donation. And the ethical conundrum and contradictions continue. But I still like shopping there, especially for their meats, and will continue to do so.